Racing Wins Review, a Tipster Stable Worth Following? 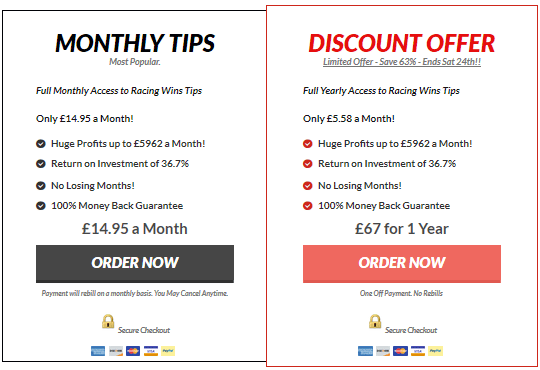 Racing Wins is a fairly new tipster service that has fantastic results advertised. The review will also look at if the impressive results can be maintained moving forward. A few of our readers have asked us about Racing Wins, a tipster service that promotes impressive profits on the surface of things. When you look at products and services as much as I do, especially during the research for a review, it is very easy to become cynical and jaded. I have written before about the kind of things to look out for when considering whether or not a product is legitimate and unfortunately, it has been a while since I have seen something that isn’t littered with these red flags. There has been a recent launch however which has been generating a lot of interest for Pete Thomson online and to my surprise, actually seems to be well put together and a genuine service. Naturally there is plenty of marketing hype, but if you have read any of my reviews before, you will know that I discount ‘hype’ during the review stage. This is inevitable and I see no reason why Racing Wins (the name of this new service) should be any different, but there is something more to it and this is ultimately what is interesting to me. 1 What is Racing Wins? 2 What to Expect from Racing Wins? 4 What is the Income Potential for Racing Wins? 5 So is Racing Wins Any Good? With that in mind, let’s take a look at Racing Wins and what, at least in my opinion, has the potential to make it stand out from the crows. One of the first things that stands out for me is actually the copy on the sales page. The creator of Racing Wins, Pete Thomson, takes a very decided swipe at a number of different tipsters. This is typically something that I would consider to be a bit of a red flag, however he backs up his argument with evidence. This shouldn’t be impressive. Unfortunately, as somebody who has looked at hundreds of horse racing services I can confirm that it is definitely not common practice. What Pete Thomson points out was actually a bit of a revelation to me. For example, until reading the sales material for Racing Wins, I didn’t realise that of all the horse racing tipsters in major UK newspapers only 17% are profitable. It isn’t necessarily relevant, but this has clearly been researched by Pete Thomson and in the long run, bodes well for Racing Wins as a service. What to Expect from Racing Wins? So what do you actually get from Racing Wins as a service? The short answer is a lot and a little at the same time. I know that this is rather contradictory but stick with me because I will explain this over the course of this article. The long answer is that you appear to be getting access to a well rounded tipster service that offers something for everybody. Now in some ways, Racing Wins doesn’t immediately stand out from the crowd. It is a rather typical affair as far as tipster services go if I am honest. Selections are emailed out on the day they are available. The emails are sent in the morning usually between 9-10 am and there are 4 selections per day. So far, I could be describing any given tipster service, but I will now explain where Pete Thomson makes Racing Wins a little different. The astute and observant amongst you will have noticed that I haven’t made reference to Racing Wins being a daily tipster service. This is because it isn’t. Pete Thomson says that he prefers to focus his betting on the most profitable days which means betting Tuesday through Saturday. The reasoning for this is two fold. Firstly, it allows both Pete Thomson and Racing Wins subscribers a few days off. Secondly (and most importantly in my book), Pete Thomson says that racing on the Sunday and Monday is rarely worthwhile following, so he doesn’t. This might sound like a missed opportunity to some but I have lost count of the number of tipsters that I have looked at that fail because they refuse to trim the fat from their services. Knowing your market well is massively important in generating anything resembling consistent profits and with Racing Wins, Pete Thomson seems to really be on top of this. As I have already touched upon, Racing Wins does provide just four selections each day however there is actually some rhyme and reason behind this rather than simply selecting four horses per day. One of the key aspects to Racing Wins is the four bet system that Pete Thomson implements which works thusly. There are 4 different types of selections which are issued. These are ranked based on how likely they are to win and range from Nap to Outsider. The Nap bet is your traditional tip, that is to say, it is the horse that Pete Thomson feels is most likely to win a race. The odds that Racing Wins identifies are rarely great on this type of bet, however I do feel like there is still a decent amount of value to be had. This differs from some services which focus so much on winning that they can forget to make sure that it ends up being profitable. This type of Nap bet has attained an incredible strike rate of 49.8% which if maintained, makes it far and away one of the lowest risk services that I Have looked at. The second type of bet is Second Best. This type o bet is very much in the name. It is the second best bet that Pete Thomson recommends to Racing Wins subscribers. The odds with your Second Best bet do creep up a little and there is definitely some better value to be had here however the win rate does drop rather significantly. In fact, over the 4 months that Racing Wins has shown proof for, the Second Best bets have averaged just 36.3% which is still respectable, however it does represent a drop of around 13% which is rather significant. The Third Best bets are again a step towards longer odds and this does once again mean a drop in some numbers although not as much as you may think. In fact, Racing Wins maintains a strike rate of 35% over its Third Best bets, a result that Pete Thomson should be proud of given the increases that are to be had here. Then there is the outsider bet – which should be self explanitory – a horse with only an outside chace of winning, but still has a chance, because it is in the race after all. At this point I should talk about the types of bets that you are placing. Pete Thomson recommends that those who are following Racing Wins back all of the above bets as straight win bets with 1 point stakes (he talks in pounds and pence however for the sake of this review I will be converting into points). All of the above bet types are straight forward win bets which makes Racing Wins pretty simple to follow. Keeping with the mood of simplicity, Pete Thomson also recommends that the majority of bets are placed with Bet365. The reasons for this are twofold. Firstly, they supposedly offer the best odds on most of the selections that are issued via Racing Wins. Secondly, should those odds drift out Bet365 offer best odds guaranteed. If there are any bets that are advised through other bookmakers, Pete Thomson will typically notify subscribers in the email. Having covered that, the final tips that Pete Thomson sends out are his Outsider bets. These are horses that have a long shot of winning and as you would expect, this does mean that the strike rate takes a massive hit. In fact, for this type of bet, just 13.8% win. That having been said, when you are dealing with odds of 20/1 plus, you do not need to win often in order to be profitable. Racing Wins demonstrates this nicely as I will look at when it comes to the results. How Much Will Racing Wins Cost Me? One of the things that I like most of all about Racing Wins are the options when it comes to receiving selections. First things first, there is a free trial available. This doesn’t require any down payment however you do only receive Pete Thomson’s selections for the Saturday. I admit that this isn’t necessarily enough to provide a robust test of the service, but I don’t think that it is a bad offering either. From here you have the option to pay for Racing Wins on a monthly basis. This costs just £14.95 per month and can be cancelled at any time. Because Racing Wins is sold through Clickbank, this does mean that there is also a full 60 day money back guarantee in place (something that Pete Thomson freely advertises on the sales page for his service). The other alternative with Racing Wins is to sign up for a full year. As with the monthly option this comes with a full money back guarantee. In the long run, it does work out substantially cheaper however. At the time of writing you can actually sign up for the 12 month subscription for just £67. This is being advertised as a limited time offer to tie in with Ascot though. On top of this you will of course need a betting bank to run Racing Wins. Pete Thomson recommends starting with small stakes. Quite what this means in terms of pounds and pence will ultimately vary from person to person however I feel that £500 as a 100 point bank (£5 per bet) is a reasonable place to start. You can still build your bank with this amount without having to risk too much. What is the Income Potential for Racing Wins? The question that really matters is how much you can make with Racing Wins and this is arguably one of the most exciting parts. First and foremost, I don’t buy into the figures quoted by Pete Thomson on the sales page. Whilst you could well have made £16,490 in 4 months with Racing Wins, this would be betting to £100 stakes. To create some context, this means betting £2,000 per month which is a hell of a lot money. In real terms, this means a profit of just shy of 165 points in 4 months which is still a very respectable figure. One of the things that I like about Racing Wins is the fact that you can choose which of the four bets to put on and this is something that can be quite important when calculating profits. 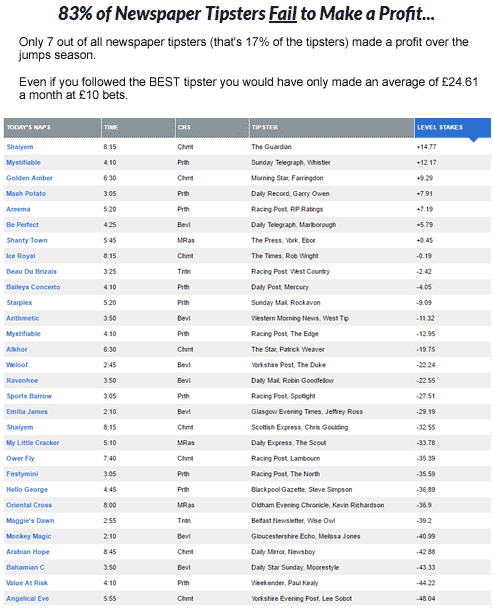 For example, whilst the NAP bets win almost 50% of the time, the ROI is just 27.2%. At the other end of the spectrum, Racing Wins’s Outsider bets have a strike rate of less than a third of the NAP bets but almost twice the ROI. 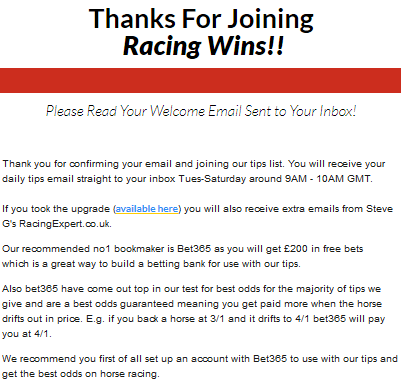 This is really positive for subscribers as it allows you to make a genuinely well informed decision about how to bet. It also means that Racing Wins can be used by almost anybody. Those who want frequent wins can follow the NAP bets whilst those who like big pay days can opt for Outsider bets or something in the middle. It isn’t very often that I say this but there is something in Racing Wins for almost anybody. So is Racing Wins Any Good? Naturally this is subjective, however there are a few issues that I have with Racing Wins which I wish to address here. The first is the lack of information on the selection process. Whilst the betting set up and the fact that full proofing is provided allows us to get an idea of what we are getting into, it doesn’t paint a complete picture. Whilst I have never expected any tipster to unveil their systems in full (if that is even possible), I do think that it is only reasonable to provide some insight. Are selections based on recent form or matching horses to races that suit them? Does the tipster look at Jockey and Trainer combinations or speed ratings? These are simple details which give away nothing, but allow you to know what to expect. The fact that Racing Wins doesn’t provide this is a bit of a disappointment for me. The other thing that I wish to point out is that whilst Racing Wins has been fully proofed, this has only been carried out for 4 months. Now some cynics will say that 12 months of proofing is the only thing that will convince them but I am not that militant. I do however believe that 6 months of proofing is a reasonable figure. This means that a service can demonstrate that it can maintain a profit over the busier and more difficult summer months. Unfortunately, Racing Wins doesn’t do this. As I have mentioned, there is still a lot of potential on offer here. The fact that Pete Thomson is willing to give his selections away on the free trial basis is definitely a boon. There is also the 60 day money back guarantee which means that even if Racing Wins doesn’t perform over the next few months, it hasn’t (at least in theory) cost you anything. There is no such things as a perfect tipster and unfortunately, I don’t think that Racing Wins really comes close to this either. There are a number of problems that I have with the service however some of these are simply based around the way Racing Wins is marketed rather than the service itself. None the less, I think that they need to be considered. If I hold my hands up, my biggest genuine concern is the amount of time that Racing Wins has been proofed for. I simply don’t see 4 months as being long enough. As a service, I like the structure of Racing Wins and the four bets system. It really does open things up and provide something or everybody. The cost is also a bonus with £15 per month being one of the cheapest tipster services I have looked at in the last few years. Finally, there is the profitability. It is clear to me that Racing Wins can make money and from what I have seen, Pete Thomson should be able to replicate this. This does however loop back to my concerns about the period during which the service has been proofed. Honestly, I think that Racing Wins is worth a go. There is risk inherent with any tipster service and to dismiss something because of this seems like a pointless endeavour. I talk a lot about Pete Thomson proving himself over the busier summer months but if he is able to continue in the same vein as he has started the year, there could very well be a decent haul to be made. If you are prudent, bet on paper for a month or so (there is always the money back guarantee in place) or try out the free trial if that seems too much. A small profit was made on the first day above. The first 2 days of testing produced a small profit, but a profit nonetheless. Our experienced tipster reviewer (Julian Daniels, who recently tested the Great Bets review results that achieved over 820 points profit in the 6 months testing period) has now taken over testing the tips, and the results. Julian uses his own real money when testing so none of the results are based on theory or paper testing, but actual fact. Full results and updates will be provided in due course – best to bookmark this page, as this looks to be an interesting one, but if you would like to test yourself, then click the link below, there is a full 60 day money back guarantee. I have been following this tipster now for four weeks, covering the period July 3rd to July 30th 2017. Bets are given from Tuesday to Saturday. Mondays and Sundays are non betting days On betting days, bets have arrived by email between 8.41 and 10.24 in the morning. There has been a few days without any bets. Each day one bet is given for four separate horse races: a favourite (to win) ; a second favourite (to win) , a third favourite (to win) and an outsider (each way). Bet size ranges from 0.5 pts each to way to 2.0 pts win. With a Total of 72 bets (that includes three void or non-runners) to date , the strike rate stands at 34.8% (24 winning bets). This has lead to a small profit of 3.03 pts. So at £10 a bet that gives a gross profit £30.30 and a net profit of £15.35 after fees. I have set aside a starting bank of 100 pts and the current bank is 103.03 pts. 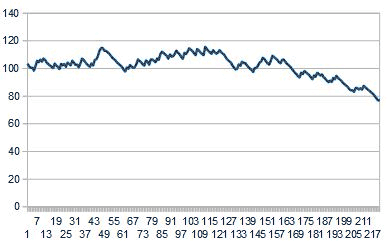 The graph below illustrates The Bank (in pts) against Bet Number. 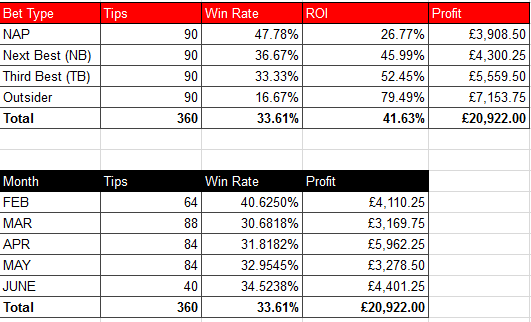 I will provide separate results for each of the four types of bets at the end of a 12 week period. I have been following this tipster now for just over two months: from/including July 3rd 2017 up to/including August 3rd 2017. With a Total of 153 bets (that includes five void or non-runners) to date, the strike rate stands at 31.8% (47 winning bets). This has lead to a small profit of 5.51pts. So at £10 a point that gives a gross profit of £55.10 and a net profit of £22.10 after fees. I have set aside a starting bank of 100 pts and the current bank is 105.51 pts. 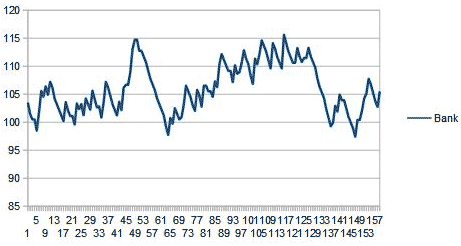 The graph below illustrates The Bank (in pts) against Bet Number. I have been following this tipster now for three calendar months from/including July 4th 2017 up to/including October 3rd 2017. I set a 100 pt starting bank and the bank finished at 77.05 pts. So a loss of 22.95 pts. 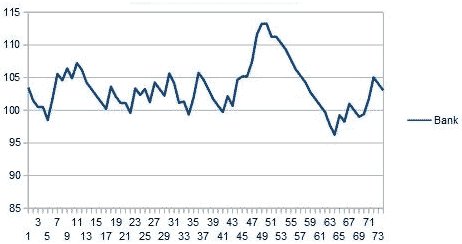 The graph below (Betting Bank against Tip Number) clearly shows a downward trend. At £10 a tip that equates to a loss of £229.50; on top of which there is the service fees of £44.97 for three months. The review has now downgraded the product to 2 stars. Your review confirms my impression of the profit potential and I agree that a longer trial period would be more convincing.The discounted 12 months contract and money back guarantee cannot be ignored so I have just signed up. However, despite being fully aware of the importance of early odds and BOG I prefer to investigate the comparative profitability of backing each of the 4 daily selections at BSP (allowing 5% commission), rather than having to open and maintain numerous Bookie accounts. I maintain very comprehensive spreadsheets and my analysis of existing results indicate that a very favourable option would be to Back to WIN only each of the 4 selections at a level stake of 1% of a common starting bank; even more so by compounding daily. The bank draw down is within comfortable comfortable limits so far and of course depending on future performance, individual bet stake % can be modified to maintain a steady upward bank growth. As always time will tell, but I must admit this is one of these rare occasions when a system at a very modest entry fee offers some hope. Hello Robert, Thanks for the comment, and I agree that it does look interesting as the results are almost unheard of in this industry, but time will tell. Thanks for the review Daniel, i think im going to stick to the betfair scalper though. Hi Daniel, is there any further updates on the recent results as I’m interested in this service. Looks Identical to racingexpert, perhaps the same service but not sure. Please respond. Hello Mike, It is currently being tested by our reviewer, and results will be posted possibly at the first month end. Hi Daniel, I bit the bullet and now trialing Racing Wins and although I am only betting on £5 per point so far the results are not very encouraging. I will continue for a couple more weeks but unless the results improve there is no point in increasing my stakes. Is your researcher having any luck. Please respond as I’m seriously thinking of getting a refund unless someone can assure me the tips get better. Hello Mike, we usually review such services over a good few months because there will always be ups and downs with such services. I have asked our researcher for an update, so I will post what they send over if it is relevant, although it may be too early to give accuracies on results, etc. Going fine with me. Up 12.25 pts since I started recording results on July 4th. Good Day today up 7pts. Hello, The first 4 weeks testing results for Racing Wins has now been added to the review. We will now complete the review after 12 weeks testing. A few months in and yet to turn any sort of profit after sign up has been taken into account, a loss in June, very small profit in July and a larger loss in August, one for the scrap heap. I would suggest you keep the stakes small and trial yourself.